With my turntable back in running order, I’ve been busy making digital transfers lately, among many other projects. But right now I’ve got a CD track and review of something new to lay on you, before we get back to vinyl time travel. . . .
I’ve enjoyed the multi-dimensional musical excursions of Papa Mali, a/k/a Malcolm Welbourne, since hearing him on his first Fog City CD, Thunder Chicken, back when I was doing radio. I listened to it a lot and played cuts on the show often. Subsequently, I saw Malcolm and his band live several times in Memphis and New Orleans and was impressed by the always cooking gumbo pot of greasy roots influences steaming out of his grooves, strongly seasoned with funk. There’s a thick, hot, humid, mind-altering atmosphere to his music both live, and, miraculously, in the studio (where many a good vibe can die); and the crazed, gonzo, go for it attitude displayed on Thunder Chicken makes it still one of my favorite albums. I featured a cut from that one during the first Carnival season here at HOTG; and, had things gone as planned, I would have featured today’s during the 2007 season; but too many things got in the way. On Do Your Thing, Mali again worked with Fog City honcho, recording facilitator, and tone authenticator Dan Prothero; and in many ways it offers a sonic continuation of the first CD: often reverb drenched and echoplexed; overdriven and vibrant as a fever dream or lowdown, dark and ominous as moonless midnight in the South Louisiana swamp. What has changed for the new one? (a) The recording venue for one: mainly Truck Farm Studio in New Orleans. (b) The special guests: Henry Butler on piano, Kirk Joseph on sousaphone, Big Chief Monk Boudreaux with the Golden Eagles Mardi Gras Indians from the Crescent City, plus other notables from all over. (c) The material. I think it’s safe to say that many of the songs this time out are built on trance blues grooves; and they're mostly originals, save for the Isaac Hayes title track that Mali takes way, way down a lost bayou, and a nice David Egan number. Those looking for the overt funk of Thunder Chicken or Mali’s side project gem, Jerkuleez, will not find much as such on Do Your Thing. Instead it is more subtle, implied, or enfolded into the often hypnotic goings on. To me, this is a deep summer, windows open, still sweaty at midnight, heat lightning playing tricks with your mind kind of record, to be enjoyed and explored after indulging in this or that effective intoxicant of choice, or however you wish to free your mind. Papa Mali offers a worthy modern day expression of the sanctified psychedelic hoodoo of Dr. John’s early days, as captured on the Gris Gris album of the late 1960’s. This man learned serious stuff from the late John Campbell*, a blues/voodooist so intense that it still spooks me to listen to his records. All that said, I’ve decided to feature the exceptional exception to that mood, “Early In The Morning”, a full-tilt run and gun riff on a Mardi Gras Indian theme, featuring the incredible drum attack of the truly gifted, surely possessed Robb Kidd. This song seems to have been inspired by the Indian song, “Let’s Go Get ‘Em”, written by Bo Dollis and Monk Boudreaux (who’s in on the vocals), but amped up to the extreme. If the Indians took to the streets at this pace on Mardi Gras Day, they wouldn’t last 6 blocks! But that’s beside the point for this mover and shaker. It’s a wild ride and an impressive turn for all concerned. A couple of other nice touches on Do Your Thing I’ll mention. Henry Butler’s Bookeresque filigreed piano solo on “Honeybee” transforms an otherwise simple soft-shoe number into something much more special. Also, on “Girls In Bossier City”, Kidd’s percussion on what sound like 55 gallon metal oil barrels resonantly reminds me of the late, great Gulf Coast street-beater of such drums, Bongo Joe. 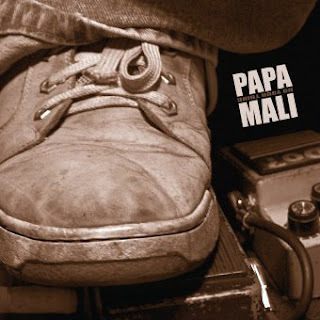 As I’ve said, Papa Mali’s influences are manifold; and I could go on. But I think his modus operandi can be simply summed up. He makes music spontaneously overflowing with the spirit of the old (and, we hope, the new) New Orleans and the re-imagined Louisiana of his youth. Check this stuff out. Thanks to Malcom and Dan for the CD and permission to run “Early In The Morning”. You can hear more and buy Do Your Thing and Thunder Chicken at the website link above or your favorite needy retailer. *Commenter, The Doorkeeper, has provided a link to a recent blog post [3/29/2007] on Campbell, with several songs, plus an interesting back story from the producer of his One Believer CD. Nice find. WOO-HOO! Totally amazing stuff here, Dan! ...like RL Burnside's ghost prowling the Ninth Ward or something. He's not gonna be at Jazz Fest?? I just got my tt back working too. indispensable tool: ClickRepair. lovin' it. Thick funk. Thanks for the tip. Doesn't look like he will be at Jazzfest proper, Red; but I am hoping he will be gigging around town at that time. His online schedule doesn't show much of anything after 4/28. I asked him via email, but haven't heard back. He's currently on the road. Glad y'all are diggin' it. This track has clearly a Mardi gras indians tribe flavour bur crossed with a hypnotic blues groove like some of old Dr John Night tripper of the 70's. It's a nice haunting and energetic number Great song Dan ! OK, so I sent away for the CD about ten minutes after I downoaded Early In The Morning, and it has arrived and whupped me way upside my head. "The Girls in Bossier City" must be something if the way-down sound of the track is any indication. I bought both cd's. I missed the tracks, but did you see the John Campbell tracks over at Jefitoblog? Thanks for the namecheck or else I'd have never known what he sounded like. Well worth a listen.